I love all of you, so it might be best to hear this from me. Sit down. We need to talk. Writers are….”different.” This might not be news to some of you, but I imagine others of you are in denial. I know I was for ages. We try SO HARD to be normal, but normal is just so, so, so…BORING normal. Our “differentness” weirds normal people out, because they’ve been trained by TV what the writer’s life should look like. Just like DNA analysis takes less than 10 minutes on an episode of Rizzoli & Isles and the bad guy is caught and in cuffs in less than an hour, what “looks” like writing and the creative process in movies? Kind of isn’t. Not even CLOSE. Too often, pop culture paints authors as caricatures instead of pros. We mainline coffee (okay, that’s accurate), are barely functioning alcoholics who dither around instead of writing. At the last moment, we are visited by the genius fairy, type for a full week 24 hours a day to turn in a masterpiece (last minute) to our agent who’s been calling over and over worried sick about us. ***Though I will cop to being a functioning yarn and video game addict. There are a lot of activities we must do to write great stories that, to the outside world, look a lot like goofing off. We aren’t goofing off (though without discipline it can become that). Lately (namely because of Shingles) I have traded Jui-Jitsu for crocheting until my doctor clears me for beating people up. But there is a LOT of thinking and pondering going on while I work on my projects. I watch series and deconstruct plots, characters, etc. I note dialogue. I contemplate ways one could kill people with crochet needles and if I could write a series called The Etsy Murders (no stealing O_o). …and have a nifty Kindle case to show for it 😀 . We must fill our creative well before we write, or we have nothing to draw from. Regular folks who clock in and clock out of jobs in cubicles are grazers. They do the same routine day after day. *munch, munch, munch*. I feel this is often why creative people feel so stifled in these environments. We’re tigers stuffed in a non-tiger role. Strong writers are apex predators who lurk, plan and power-up until go-time. 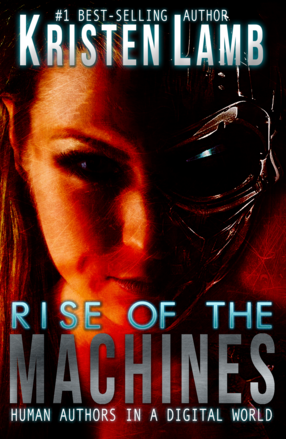 I spent two and a half years researching for my last social media book Rise of the Machines—Human Authors in a Digital World. I read stacks of books on neuroscience, sociology, communication, the history of communication, leadership, sales, etc. This probably didn’t look (to many others) like working. Yet, it was. I was filling my mental reservoir. When my hands met the keyboard, I wrote almost 90,000 words in six weeks that needed minimal revision. Same in fiction. I knew I wanted my series to involve Mexican drug cartels. What did I do? I watched A LOT of documentaries, read books, articles, blogs, collected images, and played video games. Too many writers fail to finish NaNo because they haven’t fueled up properly. If one studies any endurance athlete, what do they do before an Iron Man or the Tour de France? They EAT. A LOT. Endurance athletes know they need the extra weight because it isn’t uncommon for participants to lose as much as twenty pounds by race end. Yet, how many of us go into writing a book with a malnourished, anemic muse? Part of why I love NaNo and Fast Draft is it does a number of things. First, it tires out the analytical side of the brain that wants to edit and make everything “perfect.” REFUSE TO EDIT. If you’ve taken time to feed the muse, your “Boys in the Basement” could be doing some seriously cool mojo, and if you edit that out? You can benevolently tank your story. Often a lot of the subplots or cool twists and turns come from all the stuff we fed the muse ahead of time. For instance, there is a scene in the first book of my trilogy book where the two main characters find an old drug house and of course teenagers and addicts have been in there and there’s a ton of graffiti. There are the usual pentagrams, devil-worshipping symbols, goat heads, gang signs, profanity, etc. but my fingers typed (seemingly of their own accord) that there was also a veve of Papa Legba. Huh? Voo-doo in southwest Texas? Where did THAT come from? Probably a documentary. I began to backspace over it, but then let it ride. My FBI agent notices the veve, recognizes it, and finds it odd and “out of place.” This is all that is mentioned of the veve in this book, because my subconscious already had the plot for Book Two which involved…Santeria. My subconscious must have pulled up the multiple news stories of bodies with hearts removed (or headless) who were presumed to have been killed in ritualistic fashion by cartel leaders for otherworldly protection over their operations. My muse was placing the perfect bread crumb in the story to lead to the next one. But what if I hadn’t “wasted” all that time reading and watching documentaries? What would my muse have been able to draw from? A bag of stale Goldfish or a 10 course meal? Another reason I love NaNo is that once we tire out the analytical side of the brain, we can fall into a sort of trance, much like a runner’s high. This is where the muse hits overdrive, and, since we are SO immersed in the story, we become part of that world. This means we’re less likely to lose ideas or make major mistakes because we’re hyper-familiar with the terrain. If we start writing, then put a book away for a month and try to pick it back up, we need to do a lot of refreshing and the story can become jaunty and incongruent. My recommendation before writing ANY book is total immersion. I read a lot of submissions and many of them have a bunch of fluff and filler and that could have been avoided if the writer had more research to draw from. It’s easier to use setting powerfully if we’ve researched the terrain ahead of time. What do people in certain roles or regions talk like? The more facts, images, and stories (even news stories) we have in our head? The richer the work and the easier to give our writing texture. Later, we’ll discuss some ways to fill the muse. And yes, a lot of it might look like goofing off, but runners preparing for a mega-marathon do a lot of what looks like eating a ginormous bowl of pasta or downing special protein drinks. Not especially glamourous, but essential for success. How do YOU fuel? What things do you do to enhance creativity that looks like slacking? Are you afraid to watch TV or movies because you fear you aren’t…GASP…writing? Will announce September’s winner later this week. Have to tally :D.
WANA has a super cool class coming up October 4th. VERY RIGHT BRAIN and a cool and unique way to envision your story and prepare a rich, textured novel with deep and dimensional characters. Rachel Funk Heller is teaching Prepare for NaNoWriMo–Writer’s Coloring Book. Give yourself and your brain a play date. It’s good for BOTH of you! So nice to have someone else say that being normal is utterly BORING. NaNo all the way! Love this post! My husband teases me for playing video games or going on longboard rides with the kids, but I honestly get so much fuel for writing from these times. Thanks for sharing! Love it! This is definitely being shared on our regional NaNo page. Now to immerse myself in steampunk and Wonderland. It is a gift and a curse. blame Monk. I loved your tiger imagery. At rest, at play, at war. Writers can do it all. When I was a principal at a large school, I occasionally heard the comment that all I did was stand around and talk. And that was partially true. Like writing, principaling required lots of process time to get to the final product, an efficiently running school. Writing has so much of that process time that might look to outsiders as unproductive, but if you write you know that your core being is always at work! Great post as usual–I’ve got a weekly, two hour ‘artist date’ with my inner artist during which I fill the well. I mostly watch silly anime or lurk, goal-free in bookstores. But I can FEEL it working! I read almost the entire Dresden series in one shot, then turned around and wrote the best draft EVER. Amazing post, Kristen! It’s great to see another writer who crochets as well :). I completely agree with you that it’s difficult for a creative person to work in a 9-5 cubicle job. That’s where I am now and I’m always antsy and wishing i WAS WRITING. We have to store up on our writer fuel now, while we still can! Wow! Thanks for this really inspiring post. Downloading “Middle-earth: Shadow of Mordor” – 63 years old and as excited as a six year -old on her birthday. I love that there is this collective agreement that we’re different. I used to hate that about myself, but now that I’m older I realize it’s what makes me quirky, sometimes eccentric, but never boring, and I’ve surrendered to it. I also find that I have to go “do life” in order to have anything to write about. Sometimes I will watch the dynamics of couples or families play out in public, and I imagine their back story, or what might really be going on in their lives that no one knows about it. Maybe it’s good, maybe it makes me a little crazy. Either way, it gives me material to work with! Great article! I have my NaNo project mostly plotted in my head because it ‘a book two of my series, but I do feel the need for October immersion to prepare. I need to get on that! Thanks for the reminder. Yes! I do that! And it does look like I’m dithering. And yes! I’m typing along and, Boom! some tidbit is dredged out of the back brain and lands on the page. Perfect. You know, a few years ago I decided I no longer needed NaNoWriMo. But this year… this year I’m craving it. But I didn’t know how to tackle it again. I do often feel guilty about doing anything that isn’t writing. SO: Why are you watching Timecop? Well, I will remember all of this for the next 4 weeks, preparing for my very first NaNo! – I´m so excited! And honestly? A little anxious, too…. Thank you. Now I have a valid ‘excuse’ for the hubby every time I want to feed the tiger at the movies, bag of popcorn included. And – question for all – is it ‘cheating’ to start NaNoMo with 144 pages? My biggest challenge is NOT EDITING while I write. Or starting the next day by pretending to re-read yesterday’s writing ‘just to get a flow going’ and find out an hour later I’m still editing and haven’t written a new word yet. Your blog, as always, good advice. I’m a marathoner. I don’t own a decent pair of running shoe and consider anyone who WANTS to run 26 miles when there isn’t a decent bar at the end of the run a little crazy/amazingly inspirational but I write in marathon sessions. When I’m in writing mode ‘ve been known to crank 20,000 a weekend and one of my longest novels spewed out of my head in about 3.5 weeks–of course this is Waaaaaaaay prior to editing. When I’m not writing I’m avoiding it, giving my laptop a wide berth, dreading it, making up excuses not to do it because once I “drop into the zone” I am gone and sometimes, for me, that is a little scary. Thanks for the post. Very good advice for all of us no matter what stage! Good luck with your Etsy murders…..I can think of a few folks I’d stab with knitting needles. First, THANK YOU for reminding me that NaNo is coming. I shall start prepping to do it this year. I *have* successfully completed NaNo in other years and wanted to share a secret weapon that has helped me enormously. It’s called 30 Days of World Building by Stephanie Bryant and while it’s aimed at fantasy writers, I’ve used it for contemporary / non paranormal stories because it forces you to make some decisions ahead of time so you can focus on *story* as you write. I totally agree. Great post. I did NaNo last year and learned a lot. Wrote my own blog post on the experience, but I’m gearing up to do it again. Got a sequel out of it. Took it from thoughts and a few notes to a full-fledged novel. WOO HOO! For me, this year, I have learned I work better with a loose outline and plan on having some great brain-storming sessions AND taking notes! I’m going in well fed this time! Thanks for the post and reminder. Time to start gorging! Loved this! Reblogged it for some writer friends. Thanks for the inspiration! Blog on and drag me with you!! Love this post! Yes we are different, thanks for expressing it in ways that made me laugh and encouraged me! Awesome, Kristen! You just gave me permission to breathe and rejuvenate. I’ve been hurrying into the next book, but now I know why I’ve been struggling/resisting. I need a break. I need to look around and gather the toys and thoughts for the next WIP and to do NaN right. By me. #loveit! #perfectadvice! Priceless. See you in Nano! I knew my name wasn’t Kat for nothing; loved the tiger comparison for writers. Thanks again for another great article; looking forward to reading more on ‘how to fill the muse’. My YA thriller is centered around hi-tech and I’ve done alot of research on technology by watching hi-tech thrillers, documentaries (which has really been helpful), reading tech books, etc. The Travel channel for a feel of country scenes and locations has been superb. Thanks again for another great article. Looking forward to NaNoWriMo. Don’t forget to fill your creative well before you sit down to write. Writing requires alot of research, planning and acting like a sponge to get a feel for your novel’s subject matter. Great article from Kristen Lamb on fueling the creative process and gearing up for NaNoWriMo. YEAH! Sorry… can’t quite articulate how much I agree with this. It’s so true that writers are portrayed lazy. Consider the character in Sliding Doors when he tells his friend: I’m a novelist, I’ll never be done. Hi Kristen, thanks so much for the WANA love. Just to mention, that in my class I’ll be talking about the fact that when we learn new information, nerve cells come together in your brain and form networks. I’ve created exercises so that you will look at some important story elements BEFORE you write, helping to establish a strong neural net — so when you do start writing you will “catch” all of those great characters and details. It should be a hoot. Great post, Kristen! I need to remind myself of this all time. Even when I’m “taking a break” and reading a book for fun, part of my brain is taking it apart. And it’s easy to beat myself up if I’m not physically writing words, but lots of my process requires me to read, see, do, and digest. I can’t believe NaNoWriMo is almost here! I have to make some progress on this revision so I can spend November on another fast draft. It is so nice to know we can unite in our “weirdness” via social media. Writing can be a lonely existence, so it is wonderful that we can connect and support one another online. Thank you for the inspiring post. It can be so tough not to feel guilty when in “collecting” mode and not writing mode. I’m using October to fill that well as much as possible. OMG! “The Etsy Murders (no stealing O_o).” That was my idea, too:)!! Thank you for this encouragement. It is so easy to fall into browbeating oneself with much negative talk in regard to why the novel hasn’t been written yet …. but my book ideas are always ruminating in the back of my mind and I am constantly doing research, taking mental notes, especially as I continua to read other good mystery writers. As much as I try to explain my state of nothingness to my spouse, she still see it as, well, me doing nothing. Thank you Kristen for detailing exactly what it is I’m doing and now I have a point of reference to back me up… LOL. Seriously though, absolutely great post and I’m in total agreement with it all. And although you’ve hit home deeply to the WHY of the weirdness of us authors; I also think you may have unearthed a solution to another problem we face. The constipation of a free flowing mind or better known as the dreaded WRITERS BLOCK. Think about what the typical author does when the words doesn’t come as freely as they like them to. They force it, hate what they force themselves to write and rewrite that and then hate what they rewrote even worse. So they sit and stew about their literary impotence ( I wonder do they have Viagra for writers) and waste valuable time. Maybe they could follow the lead of Kristen and use whatever outlet they use to recharge their writers tank to actually grease the mental wheels to get those fingers tapping on that keyboard. I know when I’m forcing my work I actually click over to my favorite pass time (no it’s not surfing my Kim Kardashian app wishing I was Kanye) and play chess. I play countless games and lose so much until I can’t count that high. When the tension of not being able to write has eased off of me, I returned back to my project with a renewed freshness that let’s that caged tiger out to do what he does best and that’s create. So if its refueling your writer’s tank or greasing up blocked cogs in your brain, I think Kristen was correct when she said its ABSOLUTELY no shame in getting loss in something other than the blank screen of your laptop. Hey it’s best way to find your writing muse. Great post. I’d better get prepping, and I look forward to your posts about how to fill the muse. It makes me excited for what’s to come, that’s for sure. This post hit me deeply… I’m still slogging away at a novel I started years ago… two kids ago, which says. a lot. I’m exhausted by it yet I am not ready to give up. But I’m also not ready to devote more years… So perhaps this November it’s time to finish my latest draft, really finish it, and see, once and for all, if it’s even worth revising. Thanks Kristen for this swift kick in the pants! Okay, please write The Etsy Murders! That sounds awesome. Also, thank you for validating that I actually am accomplishing things when I read books and watch television shows in lieu of writing 24/7. You’re right, I get a lot of inspiration from doing that. Are you a writer? Have you ever considered NaNoWriMo? Then check out this inspirational post by Kristen Lamb! Kristen, I’m constantly feeding my muse, either by reading (anything and everything), listening to recorded books, occasionally watching TV, or (once in a while) watching a really good movie. My problem is that my mind, rather than being a like a steel trap, is like a steel sieve. Information drains out of it and I forget things, or only partially remember them. Having to constantly look something up that I know I’ve read before gets SO annoying!. BUT I WILL WRITE THIS BOOK! Though hell and a faulty memory shall stand in my way, I WILL WRITE THIS BOOK! Another fellow yarn-addict here. LOVE the Kindle case. I’ve been meaning to make a new one but I can’t decide between something in a a fan stitch or granny squares. Completely agree about feeding the muse. My debut novel was a paranormal romance inspired by too many hours of watching Ghost Hunters. I had to stop watching those types of shows and lay off the ghost-related stuff for a while because they were giving me nightmares. People have been bugging me to do a sequel but I just haven’t been able to come up with a good story. Then recently I got up the nerve to start watching those shows again and suddenly the story for the sequel popped into my brain almost fully formed. I just started writing it this week. I’ve been debating whether to try doing Nano this year. I’m a two-time winner, but I haven’t been able to do it for the last couple of years because my freelance work has kept me too busy to put in more than 30 minutes of writing a day. Not sure it’s going to be any different this year, plus I already started my WIP a month early. I sure do miss it, though. Great article Kristen! Now I just have to get my husband to understand this. He calls all that time “procrastinating’. LOL My blog is currently down and being redeveloped so when its back up I will definitely link some of your articles. I so agree with you about the tiger thing. I’m a tiger shopper, too. And now I feel much better about only doing ‘actual writing’ for three hours a day. The rest of the time I’m sunning my belly – er, reading, mooching about, pottering, decluttering and staring off into space. I love it. And before the year is out my WIP will finally have a first full draft – of epic length, which is awkward, because it isn’t an epic. Start the new year with scissors, I guess! Great inspiration. I often try and get myself “focused” and not day dream, but now I think of all the book ideas that come during that time. So true ! It’s hard being a writer and working a deal job at the same time. Fantastic post! I’m trying to gear up for an early NaNo (based on word sprints) and your metaphor of feeding your muse like an endurance runner is really helping me figure out how to prepare. Gearing up for NaNo. I appreciate your advice and comments. For the past week I’ve been reading the info portion for movies and television episodes on Netflix to help form my synopsis for NaNo. Now I’m imagining myself basking in the sun, pondering. Then immersing myself in more Netflix and watching documentaries. And while listening to the news tonight I heard about the eclipse. My muse is so happy she’s clapping after reading this post. A friend of mine (My Bright Spots) recommended your blog, and in particular this post, to me. I enjoyed reading it, and I needed the reminder that I need to read all of the stuff that I love that I haven’t read in years. Thank you. Great post! I read it because I just recently blogged about NaNo as well and am starting to prepare for it. You had very good points about filling up and gathering resources/knowledge by reading and watching as much as you can. I usually try to prepare for NaNo by coming up with an outline and then trying to find a matching soundtrack 🙂 Music helps me write so it’s the first thing on my list, followed by inspiring pictures I can put at the background of my writing software to keep me on the right mood (it’s a lot easier to write about summer when you see a summery picture, at least for me). Hopefully you’ll write more about NaNo-ing, as it’s always interesting to hear how other people are doing! Thanks for the awesome advice! I’m doing NaNo for the first time this year, and still gathering as much info as possible to prepare! This really helps! One of the reasons I’m a writer is that I love to learn about lots of different things. And you’re soooooo right–most people I know consider it a waste of time! Thankfully, my husband has always encouraged me to feed my imagination, and now I’m about to start on the second novel of my trilogy! I love your blog! Thank you for doing what you do! Mary, who is a knitter and crocheter par excellence, loved the graphic. I think she’s shared it with all of her knitting buddies (and she has a lot of knitting buddies). Knowing the basic four-act structure of an hourlong TV drama (I learned all about it from watching Quinn Martin shows) helps me to know when to watch for new information, possibly something I know nothing about. I’ve learned a lot about surveillance and interrogation techniques, methods prosecutors and defense attorneys use to construct or deconstruct a case, and all kinds of jams protagonists are put into and how they get out of them (The Man from UNCLE and Mission: Impossible are great for that). It isn’t as though I can’t get the same thing by reading a book, but with TV shows and movies I can feel and see when something’s coming. And seeing something on the screen helps me put the action into words and gives me a sense of how long it takes and how it should be paced. That’s as valuable as any of the new knowledge I can gain from the show. When you’re pantsing your way thru a 50,000-word story, you know that when you get to around 12,000 that you need to make something happen to take you from the first act into the second. In all seriousness, thank you so much for your motivational posts. NaNo, here I come! Love it, I am sure a tiger and certainly could not call me boring! I love exploring, roaming and discovering new places, things and ways to do things. This article has conjured up an immense sense of knowing that I am creative, its just that I have not owned and accepted it. Roar!